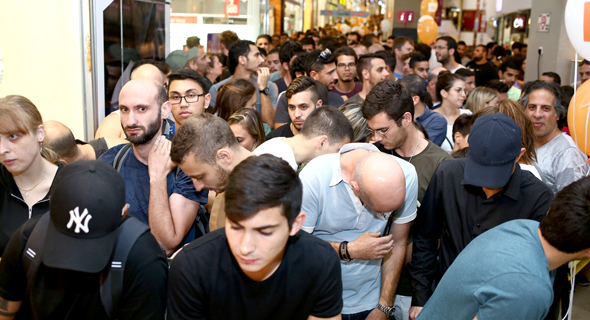 The line of customers waiting for the doors of Israel’s first flagship Xiaomi store to open spread hundreds of meters, both inside and outside of Tel Aviv’s Dizengoff Center mall. The first to arrive came in the morning hours, wanting to get their hands on discounted products at the store, which officially launched at 8 p.m. In a Facebook post published later that night, Avi Korenfeld, business development manager for Xiaomi’s official Israeli distributor Hemilton Electronics Ltd., estimated that between 1,800 and 2,000 people showed up. Xiaomi products were sold at the launch of the store operated by Hemilton at large discounts for just three hours. Lucky customers got to grab Xiaomi electric scooters at a 30% discount for just NIS 1,390 (approximately $380), robotic vacuum cleaners for NIS 999 (approximately $275) after a 30% discount, and Mi Band 2 fitness trackers complete with a rechargeable power bank battery for just NIS 29 (approximately $8) at an 85% discount, among other products. But not everyone was lucky or happy with the event. Commenting on Xiaomi’s Hebrew Facebook page, some users claimed they had to leave empty handed due to chaos, violence, and a short supply of products. Several people reported just after 9 p.m. that all discounted items were sold out. “It is a shame they only brought 50 units of each item and let people stand in line for hours just for buzz,” a user named Bar Salner wrote at 9:12 p.m. She was also among the users who complained about people cutting in line, shouting and beating one another. Another user, David Ziv, wrote that what should have been a pleasant shopping experience with his children turned into a disappointment. Approached by Calcalist, a spokesman for Hemilton said the company is still reviewing the events and is not yet ready to comment. In a statement released Tuesday, Hemilton said 10 security guards and ushers will be deployed to maintain order during the sale. During the evening hours, several dozen people also lined up across the street outside the mall, where a parallel import Xiaomi store has been operating for several weeks.